The public is invited to the Eddie G Robinson Museum on the evening of February 13, 2019 for a birthday celebration. Suggested donation is $100 with proceeds benefiting the museum. Spread the love with us on February 14, 2019 at Community Day at the Eddie Robinson Museum! 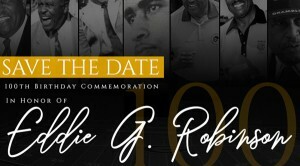 Members of the Grambling University Alumni Association are invited to attend the Eddie Robinson speaker panel at the Chick-Fil-A College Football Hall of Fame on Monday, Feb. 18 sponsored by the Atlanta Grambling Alumni Association.